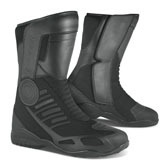 The Climate boot is constructed from leather & ventilated mesh outer. The innovative design features a waterproof breathable membrane with breathable mesh outer to keep you comfortable & dry. Micro injected inserts complete the style.